3) Note that this bar is a great idea for an impromptu set-up...if you don't have space for a permanent bar, just get yourself a large silver tray and keep it handy for entertaining. Then you can set this up anywhere for your party. I would like to be a bar stylist if my web design career doesn't work out. 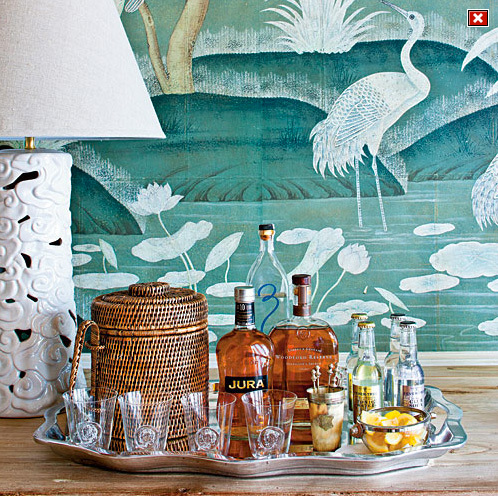 I'm obsessed with bar vignettes and how gorgeous they can be...which probably comes from my love of entertaining. And now that we're ramping up the holiday season, I have this urge to throw fancy parties and redecorate the house...and then I come back to reality. A great reality that we're in baby mode, not party mode, but still...I can have the urge. The article that uses this photo in Southern Living is a good little Q&A with Phoebs and how she goes about stocking the bar...check it out here.